Restoration of family links is one of the oldest and most traditional areas of the International Red Cross and Red Crescent Movement. The extensive experience is primarily used for restoration of family links broken during wars and armed conflicts. The main advantage of the International Red Cross and Red Crescent Movement, which is of particular importance for tracing, is the fact that the International Committee of the Red Cross and the National Societies of Red Cross or Red Crescent in the world, working together under the provisions of the Geneva Conventions, Additional Protocol and the Fundamental principles of the Movement, establish a worldwide network of the Red Cross Movement targeted at restoration of family links. Tracing Service of the Ukrainian Red Cross Society was established in June 1992 and is the officially recognized service in Ukraine, which takes measures, on a free-of-charge basis, in accordance with international rules, to find out the fate of family members affected by armed conflict and other world emergencies. Tracing is conducted through the Partner National Societies of Red Cross or Red Crescent abroad and archival institutions. Tracing Service does not have its own archive funds. * In terms of search for information on the fate of the Soviet Army soldiers, an applicant has an option to make initial search at the following websites: http://dokst.de, http://obd-memorial.ru and web portal www.krigsgraver.no (regarding the territory of Norway). Finding out the fate of relatives who were subject to political repression. Tracing and finding out the condition of graves of soldiers who died during the World War II abroad. * In terms of search for information about the burial places of the Soviet Army soldiers who died during the World War II, an applicant has an option to make initial search at the following websites: http://dokst.de, http://obd-memorial.ru and web portal www.krigsgraver.no (regarding the territory of Norway). Tracing of documents confirming the stay of people in Nazi concentration camps, ghettos and forced labour outside Ukraine during the World War II. Tracing abroad of family members, links with whom are lost as a result of today’s armed conflicts, during natural and man-made disasters and as a result of current migration processes. ** For finding out about the possibilities of tracing in this direction, an applicant should, in each case, first consult the Tracing Department of the National Committee of the Ukrainian Red Cross Society. The grounds to start investigation is a written application to the Tracing Service of the Ukrainian Red Cross Society which contains the details of the wanted person and the applicant (the full postal address of the applicant is required). An important condition for review of the application for tracing abroad is the criteria of application acceptance by the tracing services of the partner national societies of Red Cross or Red Crescent. 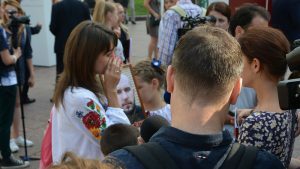 Tracing of people outside Ukraine takes time, usually at least one year, depending on the national society to which the applications are sent. Investigation procedures may be clarified at the Tracing Department of the National Committee or regional branches of the Ukrainian Red Cross Society at the place of applicant’s residence.